When I blinked my eyes open just before 5:00 am they met the moon smiling down on us in the soft hues of a clear dawn. I could have gone and got my camera to capture its deep yellow-orange but instead we just gazed at each other until the moment passed. 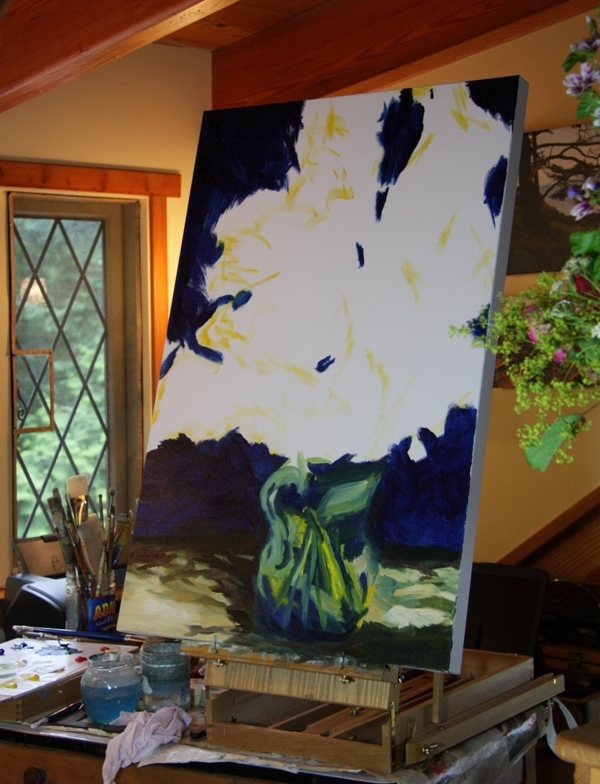 The study is to assist me with what I need to do on a larger 24 x 36 inch canvas “Always Roses” that is in progress. I wanted to try a new red that I thought might make a better pink for my roses. But I am not sure I am convinced. None the less, my sweetie is taken with this study so I thought I would share it with you. 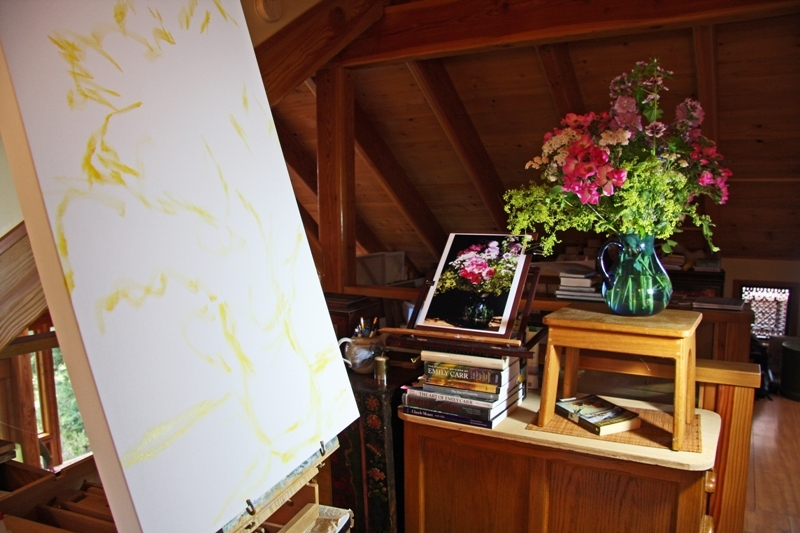 For the larger painting, I had found the perfect light one afternoon but of course the day I started painting it is different and my squished studio space doesn’t offer anything close. So I did the best I could in combining my painting day with the light from the day before. The lighting is completely backwards. However, I wanted to paint so we just went with it. I decided on an approach of working from the outside in until my subject revealed itself out of necessity. You can get an idea about how this works in these two images. But is there anything left to say about a still life vase of flowers with roses? After hundreds of years of paintings of this subject it doesn’t seem like there is much. Yet, I cannot resist. I must! In fact all of the other “to do” items have been shoved aside – including getting some food in the house to eat. Well I did find a chunk of cheese and a pear. Not starving – just limited in choices. 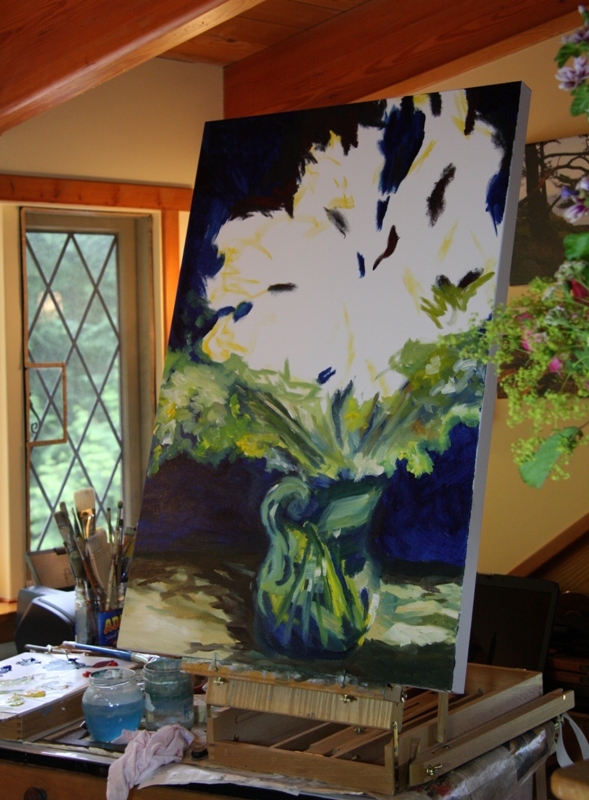 I notice now how I shifted the shape of the vase to fit the compositional differences in the frame dimensions I am for the painting. That definitely wasn’t a conscious choice. Let’s see what the painting in process looks like now though the glow of wet paint is making some parts look lighter than what is actually on the canvas. 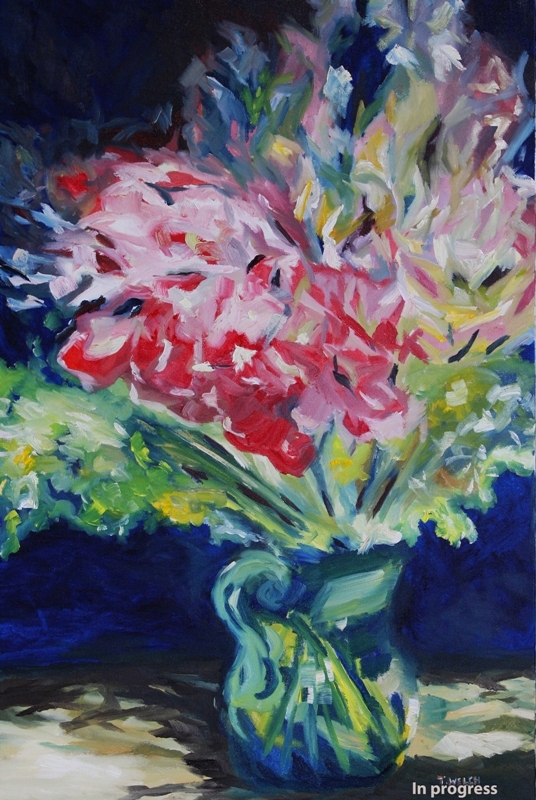 I am fascinated how the image changed perspective so that the viewer is looking slightly down down on the arrangement. This is not the case with my set up. However, the canvas is so tall that I had to reach way above me to paint. Now I am off to see if I can find us the perfect pinks and see if I can finish it with some measure of success! SPROUT: What colour have you most wanted for something and had the least ability to describe? You are a woman after my own heart! I resonate with the way you use a footstool on a table top to display your roses. Further, I appreciate how you buck convention and worked this painting from the outside in. SPROUT: What color have you most wanted for something and had the least ability to describe? Bottle green (I know exactly what I mean, most other people don’t). Yes Laurie bottle green is might difficult to describe and even more difficult to paint I would think. I didn’t really display my roses on a footstool on top of a table though. I just needed them higher to be able to see properly to paint 😉 I would have though if I thought it would work best! I also know MR. BLANDINGS well too, and remember Myrna Loy’s color request. Your own appointments with the easel these past days have yielded some gorgeous art, both in shades of pink and yellow. I just this past week tried to explain to a worker at Home Depot that I wanted a darker shade of brown for the outside foundation of my home (it needs painting bad) and eventually we settles on a color known as ‘Italian Roast.’ I’ve yet to apply it, but it’s just what the situation needs. Oh that brown sounds perfect Sam! and thank you for you youtube link as well. Yes, I have been having fun with a wee bit more colour these days. A nice change actually. P.S. I watched a longer clip from this musical as well and I don’t think I have seen this movie. We will have to put it on our list. A perfect fit for my current adventure into the pinks as well! Thank you again for thinking of it Sam. 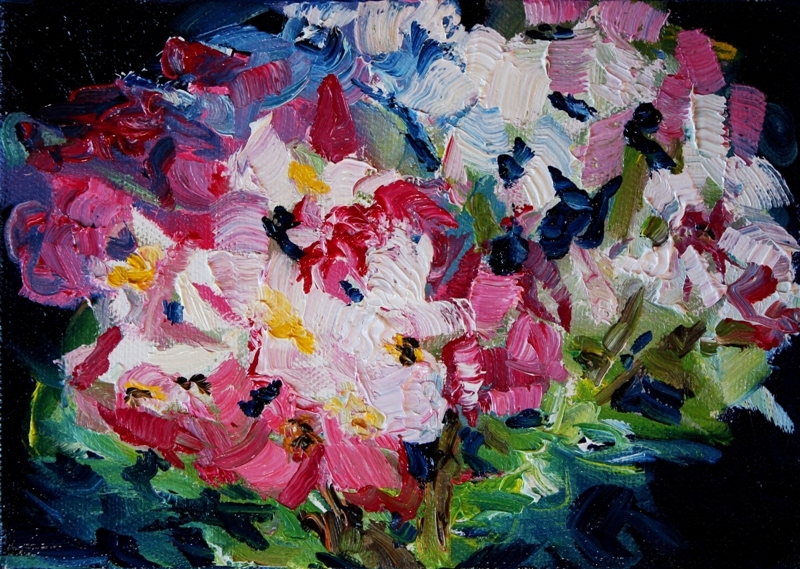 You did not have to show me anything else except the first photo of the painting, I fell in love the moment I saw the colorful impressionistic view of flowers. Of course following your creative journey is always, always as lesson is thoughtful, creative expression. Than I wanted to see the photograph that you took. There are moments when color is just not the same as when seen in the light of day, and the light of day is the factor, morning light, evening light, gray filled over caste light, etc. Shadows, no shadows, depth or just what is in front of us. I just have difficulty capturing red, and some orange’s, the information seems to suggest to shoot at a different setting, darker, because reds tend to burn out.